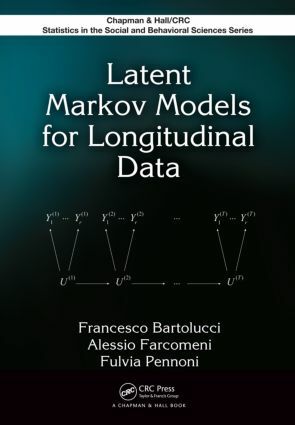 Drawing on the authors’ extensive research in the analysis of categorical longitudinal data, Latent Markov Models for Longitudinal Data focuses on the formulation of latent Markov models and the practical use of these models. Numerous examples illustrate how latent Markov models are used in economics, education, sociology, and other fields. The R and MATLAB® routines used for the examples are available on the authors’ website. The book provides you with the essential background on latent variable models, particularly the latent class model. It discusses how the Markov chain model and the latent class model represent a useful paradigm for latent Markov models. The authors illustrate the assumptions of the basic version of the latent Markov model and introduce maximum likelihood estimation through the Expectation-Maximization algorithm. They also cover constrained versions of the basic latent Markov model, describe the inclusion of the individual covariates, and address the random effects and multilevel extensions of the model. After covering advanced topics, the book concludes with a discussion on Bayesian inference as an alternative to maximum likelihood inference. As longitudinal data become increasingly relevant in many fields, researchers must rely on specific statistical and econometric models tailored to their application. A complete overview of latent Markov models, this book demonstrates how to use the models in three types of analysis: transition analysis with measurement errors, analyses that consider unobserved heterogeneity, and finding clusters of units and studying the transition between the clusters. "I enjoyed reading this book very much: the writing style is clear and concise, and the mathematical presentation is easy to follow. Notations are well thought out and the technical derivations are thorough. The book is a valuable resource on latent Markov models to students, researchers, and practitioners." "… a useful contribution to the literature. … The exposition is easy to follow for anyone who has encountered random effects models for longitudinal data. … The overall structure is well thought out. … The authors clearly have considerable practical experience in the application of this technique, and they have made important contributions to its literature." "The book gives an excellent introduction as well as coverage of theoretical basics of latent Markov model analysis and their practical applications. … I enjoyed reading the book, its clarity of exposition, its fairly compact format, and carefully worked out examples that did a good job in illustrating the background theory." Francesco Bartolucci is a professor of statistics in the Department of Economics, Finance and Statistics at the University of Perugia, where he also coordinates the Ph.D. program in mathematical and statistical methods for the economic and social sciences. His main research interests include latent variable models for cross-sectional and longitudinal categorical data, with applications ranging from educational and psychometric contexts to the analysis of labor market data. Alessio Farcomeni is a researcher at the University of Rome "La Sapienza". His interests range from analysis of panel data and categorical time series to multiple testing, multivariate analysis and clustering, and model selection. Fulvia Pennoni is an assistant professor of statistics in the Department of Statistics at the University of Milano-Bicocca. Her main expertise encompasses latent variable modeling. She is currently carrying out research in methods and statistics with intensive statistical programming applications.